Some years ago I decided I wanted to design my own homebrew setting for Dungeons and Dragons; a world where all the future campaigns that I run would take place. There was nothing wrong with the existing settings created by Wizards of the Coast, of course, but I wanted something more personal. The resident DM of our group, putting so much work into his own setting of Dorsan’dain, may have had an effect on me. Whatever drove me, I sat down and started working. My plan was that, over time, the setting would be fleshed out, the map updated, the inhabitants born. This world was named Aeramis. All the games I’d run would carry the title Tales from Aeramis, though this was later changed to Legends from Aeramis, with a sub-title detailing the actual campaign. I liked the idea that, like American Horror Story or Goosebumps, all these campaigns would be separate but connected to each other through the world that they take place in. An anthology of sorts. In-universe, Legends from Aeramis represents a book series, both on Aeramis itself (with the individual campaigns basically becoming stories and legends on Aeramis, like the stories of King Arthur, Beowulf, or Gilgamesh in our world), and in the settings that other friends design where they would be little more than fictional stories and easter eggs. The original game was Tales from Aeramis: The Final Vestige (though there are people in the world today who will swear to you it was actually called Tales from Aeramis: With a Hint ‘O Cannace; I have no words for those people). I could tell you what the plot was, where the story was going to go, who the main villains were; but the campaign hasn’t actually finished yet. Why? I made the foolish mistake of trying to run it during the last half of my senior year at college. We went through half a dozen sessions or so before we all graduated, and then we all moved. The campaign never came together again, though I hope some day to return to that story, which would now be re-named Legends from Aeramis: The Final Vestige. Perhaps part of its plot will find its way into this new installment; an installment called The Nacre Amulet. This campaign will take place on Aeramis, like the last, but with an added change. Legends from Aeramis: The Nacre Amulet will be released in podcast form every two weeks. We shall be playing on Fridays, with the episodes released the following Saturday (er… or up to Monday; the first week will decide that for me). The first session will be played on January 1, 2016 (yes, this week!) and released in the days after, whenever iTunes approves the podcast for release. Anyone interested can listen through Youtube or here on the blog itself until then. For now I will be releasing some lore and information about the setting; whatever strikes my fancy, and whatever I feel like I should explain. There’s details and information about the world that I’ll be keeping secret, and other details that will probably never come into play. These posts will be tools for my players as well as you, the reader/listener, provided that you are interested learning about my setting. Aeramis is a planet. It is smaller than Earth, with a radius of around 3,000 miles. Despite this, the gravity on Aeramis is the same, due to it’s higher over-all density than the Earth; (7.4 grams per cubic centimeter, compared to Earth’s 5.5 grams per cubic centimeter) due to some rather mysterious forces acting within the planet’s core, ultra dense materials in the same location, or something else unknown to the inhabitants. The golden sun (a G6V class star, for all you astronomy nerds) that orbits around Aeramis, is formerly named Galaz, though most inhabitants simply call it “the sun”. Aeramis also has a single moon, named Aoede, which likewise is simply referred to as “the moon” and orbits much closer to Aeramis than the sun. It’s radius is approximately 1/4 the radius of Aeramis. Geopolitically, geographers on Aeramis considered it to have three continents, one much larger than the other two, and a scattering of other smaller bodies. This here is a simple geographical map of Aeramis. 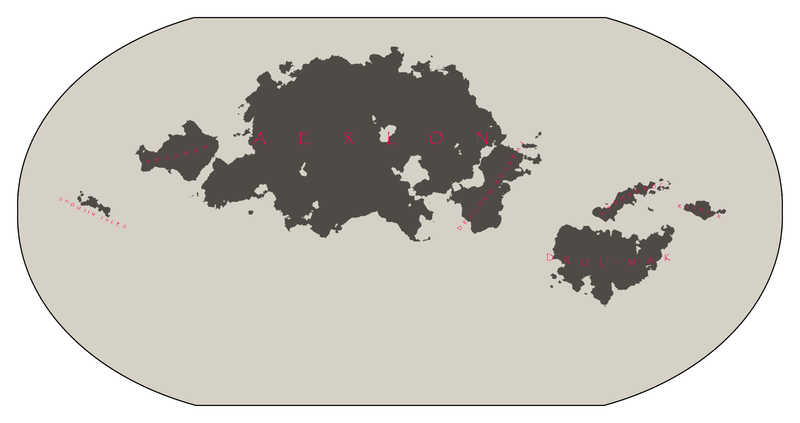 Aerlon is the largest continent on Aeramis, and is about half the size of Australia. On it live many civilizations, but the largest is known simply as the Realm of Aerlon, the kingdom of humanity, ruled by King Myron Roderick Vaeronel VII. The kingdom is named after the continent, as the first king of the Realm, Stigand Reynfred I, believed he could unite all of Aerlon. Other major civilizations include the dwarves of Grim Angaz, ruled by King Bramrim Scaleslayer, and the wood elves of the Weald, ruled by the Lady Glânelleth Lúinwë. Orcs on Aerlon live in clans, of which there are three major ones; the Blood Arms (Gijak Drkar, or Drkar for short) to the southwest, the Sand-Dwellers (Croskr Kruske, or Kruske) to the east, and the Mountain Skins (Loktu Ogd Drulk, or Drulk) to the north. The Drulk seem to have recently formed a treaty with the giants of the Ash Rock Mountains, an alliance which makes Lady Lúinwë particularly uneasy. This is an outdated map of Aerlon, back when the continent itself was known as Aeramis (this, obviously, changed as I built the setting). However, you can see a few key landmarks that I describe below, such as the massive mountain of Astaroth Hahta. I’m currently developing a new map, which will have some differences and the overall scale will appear larger. But for now, this is the gist of what Aerlon, the main setting, will be. Near the center of the map, separating the Weald from the rest of the Verdant, is a large fissure in the center of a crater. This is the site of the ritual of the Black King of the eladrin, and currently is the largest and only publicly known entry down into the Underdark on Aerlon. To the north, easily visible on the map above, is an extremely tall mountain. This peak towers above the rest of its brethren, so high that it is visible from nearly every point on Aerlon. It’s official name is Astaroth Hahta, given to it by the elves, but to many of the Common-speaking folk of the world it is simply “The Pinnacle.” Astaroth Hahta rises up over 20,000 meters (more than 65,000 feet, or 12.4 miles) above sea level. It is not only tall, but startlingly thin; by comparison Olympus Mons, a volcano on Mars, rises to nearly 22,000 meters. But while Olympus Mons is taller, the martian volcano is also extremely wide; as wide as the country of France (some 570 miles). Astaroth Hahta, meanwhile, is only about 150 miles wide. Why this mountain should exist as it does is a mystery, but the commonly accepted theory is that it was created by the gods. As such, many individuals have decided that the mountain’s peak must have some significance. Yet all those who have climbed the mountain have failed to reach even close to the summit; magic seems to breakdown at the high altitudes, and even dragons have not been able to reach the peak. The highest recorded climb so far is by a man named Hulst, who reached approximately 36,000 feet before turning back. He leads the Priory of Astaroth Hahta, where the mountain is worshiped as a gift from the deities of the world or, perhaps, by De’em himself. To Aerlon’s east and slightly south is a smaller continent, Drul’Mak. There live the dragonborn and their “god-king” and “god-queen”, the dragons Aurumas and Argenta. The Holy Empire of Arkhosia and the Kingdom of Aerlon were at war for some decades, but recently both states have come to an uneasy peace with the revival of the yuan-ti of Sshhreroc, a third and even smaller continent to Drul’Mak’s north (yes, they were fighting a war on two fronts and yes, they weren’t doing badly for themselves). The small sub-continent to the south-east of Aerlon, Drachen Retreat, was the main site of a lot of battles between the two countries. It is essentially a demilitarized zone today. The yuan-ti are led by the Mistress Nagissha and her consort Yishhvara. Meanwhile, the xenophobic lizardfolk of Rashz’k, a landmass to Drul’Mak’s northeast, keep as much to themselves as possible. 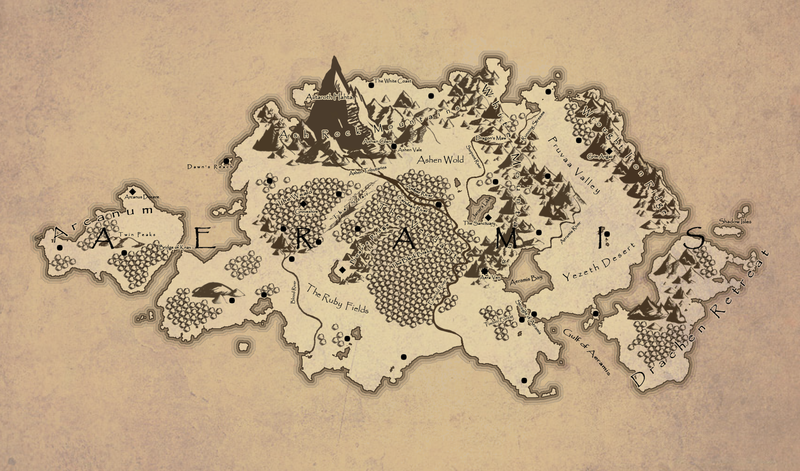 There is another sub-continent visible to the west, Arcanum, which is part of Aerlon. This was once its own country, run by a guild of mages, that broke down some thousand and a half years ago and was absorbed into the Realm of Aerlon. Today the history of Arcanum is remembered through the Arcanus Docere, a sort of school for mages of all varieties, headed by Archmagus Thraen Krylos. After the breakdown of its government the capital was re-purposed into the school. Another country, the Kroscala, fell in the early centuries of the Fifth Age. Its lands are now a mostly barren and uninhabited province of Aerlon known as the Wold. The rest of the world is relatively unknown, though there is a second (and much smaller) civilization of humans living on a chain of islands to the southwest who call themselves the Shou. This island chain is heavily inspired by Japanese and Chinese mythology and motifs, and many creatures live there not found in any other part of the world. Additionally, there exists a legend of another continent in the middle of the Inerian Ocean, the large body of water that surrounds the far side of the planet. Here, presumably live the gods. Or perhaps they are the remnants of the ancestral race of (whatever race the person telling the story is). Or maybe that’s the site of a vast and powerful weapon. Or again it could be the location of a “fountain of youth.” Many tales exist of this Lost Continent, though whether it is real or not remains to be seen. That’s all for now! As I mentioned previously, we’ll be starting the campaign this week. Stay tuned for the first episode, and more information in the coming days and weeks. Next Post Sins of the Prophets Alpha v0.75 Finally Released!